A. Meaning--the word "shawnee" (or the close approximation thereof) means "southern" in many other native languages--although how far south the Shawnee originated no one is really sure, because the Shawnee were an extremely mobile people. 1. Adena People--existed in the early Woodland Era, from about 1000 to 200BC. The Adena were probably were not a single "tribe," but a group of people probably loosely related who shared a burial complex and ceremonial system.They were the first people in this region to settle down in small villages, cultivate crops, use pottery vessels, acquire exotic raw materials, such as copper and marine shell, to make and bury their honored dead in conical burial mounds. The Adena grew a variety of plants in their gardens, including squash, sunflower, sumpweed, goosefoot, knotweed, and maygrass. This set of native plants often is referred to as the Eastern Agricultural Complex. The Ohio and Mississippi valleys were one of only seven regions in the world where people turned local plants into the basis for a food-producing economy. The consequences of this change in how people made a living would be far-reaching. The Adena lived in small villages near their gardens, but they likely moved frequently as they continued to follow a hunting and gathering way of life, which they supplemented with the harvest from their gardens. Adena pottery consisted of large, thick-walled vessels that likely were used to cook the ground-up seeds of the Eastern Agricultural Complex into a gruel something like oatmeal. 2. The Hopewell Tradition--succeeded the Adena era, having its greatest prominence from about to about 500ACE. 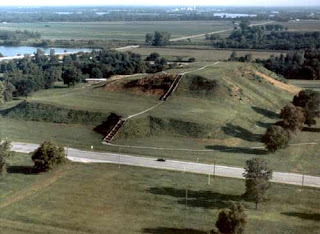 It is characterized by gigantic mounds and earthen enclosures in a variety of shapes, magnificent works of art crafted from raw materials brought to Ohio from great distances, and particular styles of stone tools and pottery unique to this time and region. 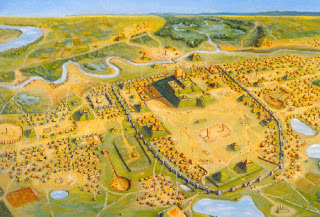 The Hopewell culture developed from the preceding Adena culture, but the Hopewell culture built much larger earthworks and greatly expanded the area from which it obtained exotic raw materials, such as shells from the Gulf of Mexico, copper from the Great Lakes region, mica from the Carolinas, and obsidian from the Rocky Mountains. The archaeologist N'omi Greber refers to the rise of the Hopewell culture as an "explosion" of art, ritual, and ceremonial architecture. 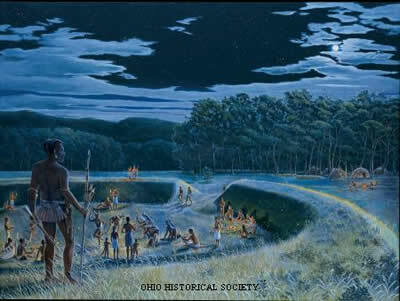 The earliest evidence for the Hopewell culture is in Illinois, but the most spectacular earthworks are in southern Ohio and Indiana north of the Ohio River, especially in the valleys of the Great and Little Miami, Scioto, and Muskingum rivers. The Newark Earthworks, Ohio's official prehistoric monument, is the largest set of geometric earthworks built by the Hopewell culture. 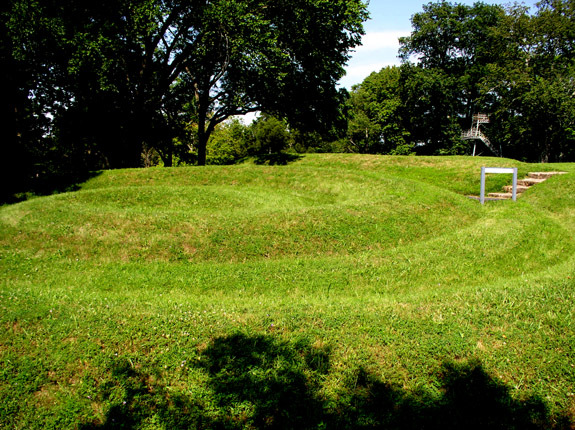 The Fort Ancient Earthworks, in Warren County, is the largest example of a hilltop enclosure. 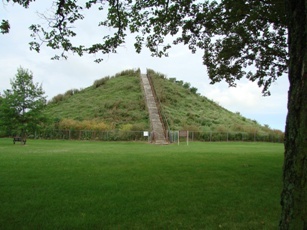 The largest set of Hopewell burial mounds is at the Mound City Group in Chillicothe. All three of these sites are National Historic Landmarks and all are being considered for nomination as World Heritage sites. These large earthwork sites were not cities. They were places of ceremony, including rituals related to the burial of the honored dead. 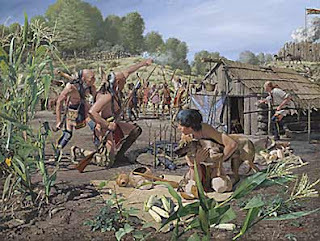 The Hopewell people lived in small villages, or hamlets, scattered throughout the river valleys of southern Ohio where they grew a variety of crops, including sunflower, squash, goosefoot, maygrass, and other plants with oily or starchy seeds. They also gathered wild plants, hunted for deer and other large and small game, and fished. The earthworks also must have served as places for these dispersed groups to gather periodically to renew friendships and socialize. The Hopewell culture had leaders, but they were not like powerful rulers who could command armies of slaves and soldiers. Many people from different villages worked together to build these large mounds and enclosures. The Hopewell "explosion" was brilliant, but brief. It was all over by AD 400. The reasons for the decline of the Hopewell culture are not well understood. The shift during the succeeding Late Woodland period to larger villages surrounded by walls or ditches hints that increasing conflict may have been one factor in the abandonment of the earthworks and the far-flung networks of exchange. 3. Cahokia Mounds--years after the decline of the Hopewell tradition, a new native culture developed a couple of hundred miles to the west, in the Mississippi River Valley, about 10 miles east of present-day St. Louis. The site known as Cahokia, at its height, was probably one of the largest "cities" in the world, with a population in 1250 greater than that of London. 4. 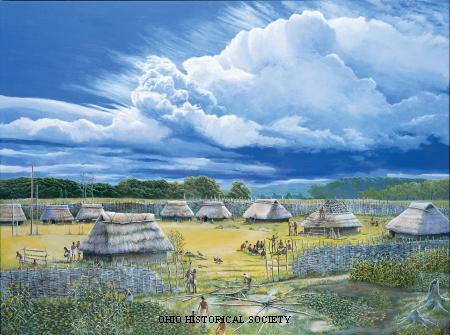 Fort Ancient Culture--developed about 1000ACE; like Cahokia, Fort Ancient Culture explodes with the introduction of the cultivation of maize. The Fort Ancient culture thrived in southern Ohio and northern Kentucky. Villages were made up of a number of circular or rectangular houses surrounding an open plaza. The Fort Ancient people continued to build small burial mounds, but gradually shifted to burials in a cemetery area with no mounds. Fort Ancient features 18,000 feet of earthen walls built 2,000 years ago by American Indians who used the shoulder blades of deer, split elk antler, clam shell hoes and digging sticks to dig the dirt. They then carried the soil in baskets holding 35 to 40 pounds. Portions of these walls were used in conjunction with the sun and moon to provide a calendar system for these peoples. There is evidence that the Fort Ancient culture built Serpent Mound in Adams County, Ohio. They also may have built the "Alligator" Mound of Licking County. 5. Early Shawnee Culture--Uncertainty surrounds the eventual fate of the Fort Ancient people. Most likely their society, like the Mississippian culture to the south, was severely disrupted by waves of epidemics from new infectious diseases carried by the very first Spanish explorers in the 16th century. After 1525 at the Madisonville-type site, the village's house size becomes smaller and fewer with evidence to be "a less horticulture-centered, sedentary way of life".There is a gap in the archaeological record between the most recent Fort Ancient sites and the oldest sites of the Shawnee, who occupied the area at the time of later European (French and English) explorers. 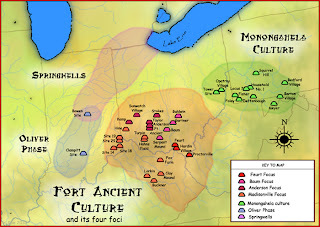 It is generally accepted that similarities in material culture, art, mythology, and Shawnee oral history linking them to the Fort Ancients can be used to establish the shift of Fort Ancient society into historical Shawnee society. 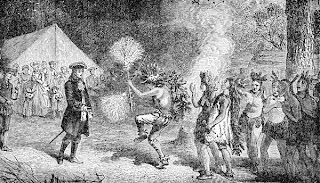 The Shawnee traditionally considered the Lenape (or Delaware) their "grandfathers". The Algonquian nations of present-day Canada regarded the Shawnee as their southernmost branch. 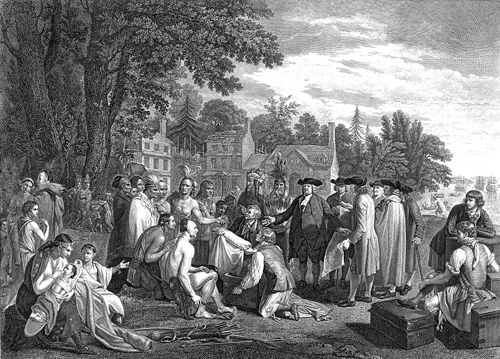 Along the East Coast, the Algonquian-speaking tribes were mostly located in coastal areas, from Quebec to the Carolinas. Algonquian languages have words similar to the archaic shawano (now: shaawanwa) meaning "south". However, the stem shaawa- does not mean "south" in Shawnee, but "moderate, warm (of weather)". In one Shawnee tale, Shaawaki is the deity of the south. Petekoθiteewomhsoomi (Rounded-feet name group)—represents carnivorous animals like the dog, wolf, or whose paws are ball-shaped or "rounded,"
θepatiiwomhsoomi (Raccoon name group)—represents animals having paws which can rip and tear like those of a raccoon and bear. Membership in a division was inherited from the father, unlike the matrilineal descent often associated with other tribes. Each division had a primary village where the chief of the division lived. This village was usually named after the division. By tradition, each Shawnee division had certain roles it performed on behalf of the entire tribe. By the time they were recorded in writing by European-Americans, these strong social traditions were fading. They remain poorly understood. Because of the scattering of the Shawnee people from the 17th century through the 19th century, the roles of the divisions changed.